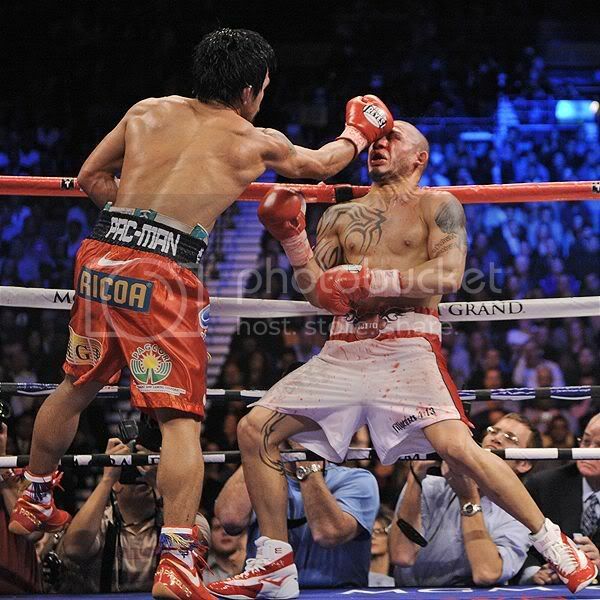 Manny Pacquiao Makes History with Miguel Cotto TKO! What a win! Pacquiao adds to his legacy! Very fitting as Manny Pacquiao comes out and enters the event hall packed full of Filipino fans as well as Puerto Rican fans at the MGM to one of my all time favorites, “Eye of the Tiger”. Very much like the fictional character, Rocky, who’s loved by the mass as the people’s champion. And the fact that he’s always sporting a smile seems to be an obvious trademark that many have grown to love. Now that the man has won his seventh belt in seven divisions, what is next? Well, as stated, he has a concert to do right after the fight with his band from the Philippines. CRAZY! As it should be, “Work Hard, Play Hard”. Vacation with his family and friends is also in the mix. But what many others want to know, such as myself, what about Floyd Mayweather? We’ll see… As much as I want to see this, I personally don’t see it as Mayweather seems to cherry picks his opponents and uses money/contract disputes as excuses. Again, Manny Pacquiao TKO Miguel Cotto in the 12th round as the ref steps in to stop the fight. Pacquiao wins by TKO! In the meantime, I’m waiting for that next fight of the century. Manny Pacquiao vs. Floyd Mayweather!